Jonathan M. Sweet is the author of several books and the proprietor of Smoking Cat Productions. He has quite an interesting Wikipedia page, too. 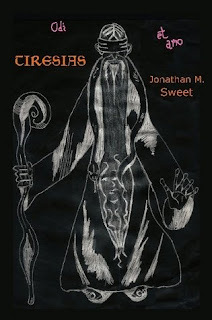 Check it out and you'll find some background information about how TIRESIAS was conceived and written. It's partly autobiographical and that's a little disturbing, since the book I would compare this to is Robert Bloch's PSYCHO. It begins with a sort of mistaken identity situation which escalates to murder and a much more dangerous identity crisis. The book had me guessing even though I thought I knew where it was going because I had read about it in the Wikipedia post. It will puzzle and disturb you too. Sweet knows how to write and handle dialect in the southern style and he has some axes to grind. I believe we've encountered the most dangerous loon yet in our sanctuary. You won't forget this book. It's $18 through Lulu.com or the Ramble House web site. The First Knees Calhoon Novel Est! Knees Calhoon has been many things: a snooker player, a rock&roll band, a Commodore 64 programmer, an evil clone, and now he's a slugabed detective. With THE NAKED TROCAR as the debut novel in what purports to be a series of mys-adventures in the Farmington New Mexico area, he uses his penchant for the inappropriate phrase to foil murderous villains, and yet never passes up an opportunity to wolf down a onion-laden enchilada plate or take a few hits off his trusty one-hitter. In his first case he was just minding his own bidness at the Avery Hotel when Molly and Wally, corrupt cops about town, give him a ticket for parking too far away from the curb. What follows is a almost true story, replete with possible factoids about real people from the tumultuous 1980s, factoids that will rip the lid off the seamy underbelly of the mortuary bidness of San Juan County. 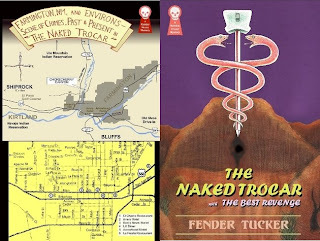 Get ready for a roller-coaster ride down Harper's Hill when you read THE NAKED TROCAR, available from Ramble House. The book also contains another short story about Farmington as it was back in 1899. Subtitled "A Sort of Western", THE BEST REVENGE features an odyssey across Colorado by a young man who is caught between two warring centuries and technologies and the evil cowboys who killed his father and didn't even know it.